The men of the Rivers State Police Command, on Thursday, exhumed the decomposing corpse of a woman allegedly murdered by her lover in Rumuepirikom, Obio/Akpor area of the state. The woman, who was said to have been in a relationship with one Udenna Uwabie, also known as J-Boy, was buried in her lover’s room after he allegedly killed her on Sunday, December 2, 2018.
disagreement after he accused her of having an affair with another man. 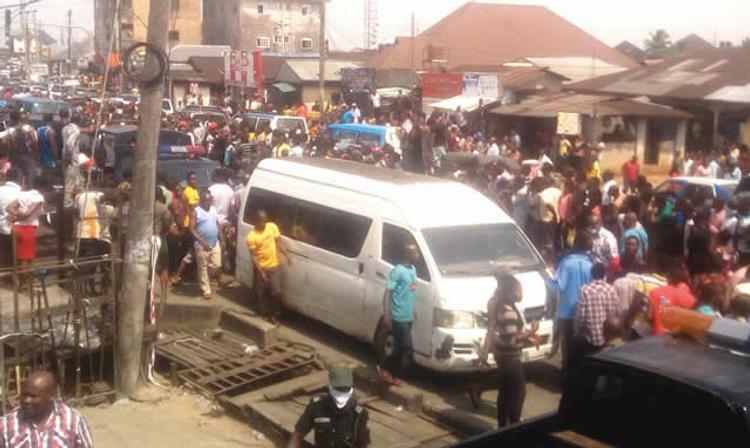 It was observed that a large crowd had gathered around 10am on Thursday at a house located along Wimpey, Ikwerre Road in Port Harcourt, where the deceased was buried, to witness the exhumation of the corpse by the police. An eyewitness, who identified herself as Chika, said the police arrived the scene of the incident, went inside the suspect’s room, opened a shallow grave found in the room, and exhumed the decomposing corpse of the lady. The correspondents, who visited the scene of the incident, observed that policemen were positioned at strategic points to forestall any form of violence, while shops were closed and the compound, where the corpse was exhumed, was deserted.